Codewords are an absorbing variant of a crossword puzzle that test your word and vocabulary skills, with a little bit of logic thrown into the solving mix too. 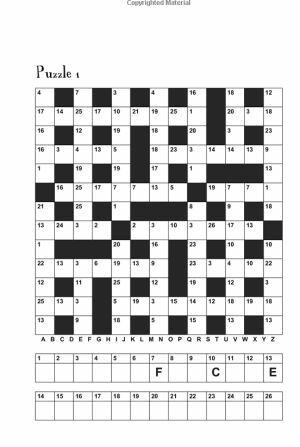 The aim of each of these 100 puzzles is to complete the grid as one would a valid crossword, with a genuine word appearing in each across and down run of the puzzle, as with a normal crossword. But this is no ordinary crossword, it is a coded one! This means that each letter of the alphabet from A - Z has been replaced with a number, from 1 - 26. You need to crack the code. To help out you are given the identity of three of the numbers - that is, the letter that they stand for. Therefore the first step will be to go through the puzzle grid and look for each instance of that number in the grid. Wherever it occurs, enter into that square the corresponding given letter. There is a letter bar containing each letter from A - Z: cross-off each letter you find so that you know you have already worked out the number that codes for that letter. Remember that each number codes for only one letter, and that every letter from A - Z is coded for and hence appears at least once in the grid. 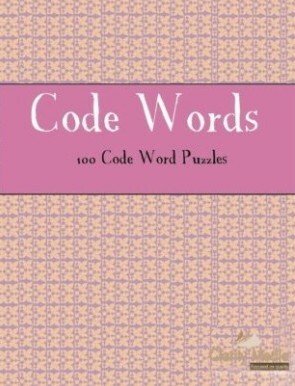 If you've not done codewords before, then you're in for an enjoyable challenge, whilst if you are a codewords pro then you will still enjoy the puzzles in this book. Remember if you get stuck to think about things like letter frequencies: which letters occur the most in English and are therefore most likely to be represented by the numbers that occur the most in the grid; also look at word endings and other standard word patterns that occur in English (as a trivial example, if you have found the 'Q' then you have almost certainly also found the 'U': the letter after the 'Q', unless the word is something like 'Qatar'! These 100 puzzles are laid out one per page, and there are full solutions at the back, so if you get stuck you can seek assistance, and indeed check your solutions too.